In 2017 I wrote on this blog that the economy seemed sluggish and interest rates might fall in 2018, but it seems we can forget that now. 2018 is barely a week old and after booming employment growth in 2017 this year we’ve already seen commodity prices such as iron ore surging, Pilbara’s monthly iron ore exports hitting a record high, and consumer confidence surging to the highest level since Joe Hockey was at the Treasury helm in 2013. The tourism and education sectors are firing, infrastructure projects have seen construction work expanding significantly, and services investment is looking up (while mining investment has actually been rising again after five years of declines). And now, in case all that wasn’t enough, residential construction is defying gloomy predictions too. Building approvals trounced market expectations of a decline in rising by +11.7 per cent to 21,055 in November, the third highest monthly result on record, and with commercial approvals also rising strongly the total value of approvals jumped +14.7 per cent to a record high of $7.7 billion. 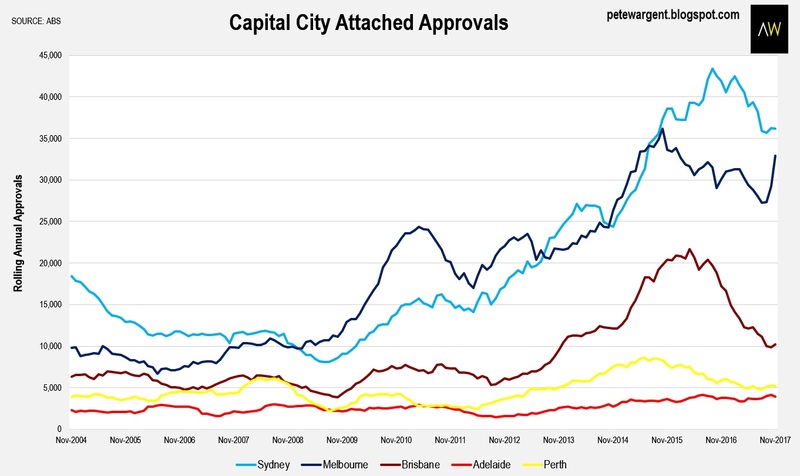 The monthly increase in residential approvals was almost entirely due to a thumping 6,287 attached dwellings approved in Melbourne, the biggest monthly result ever recorded for any capital city. 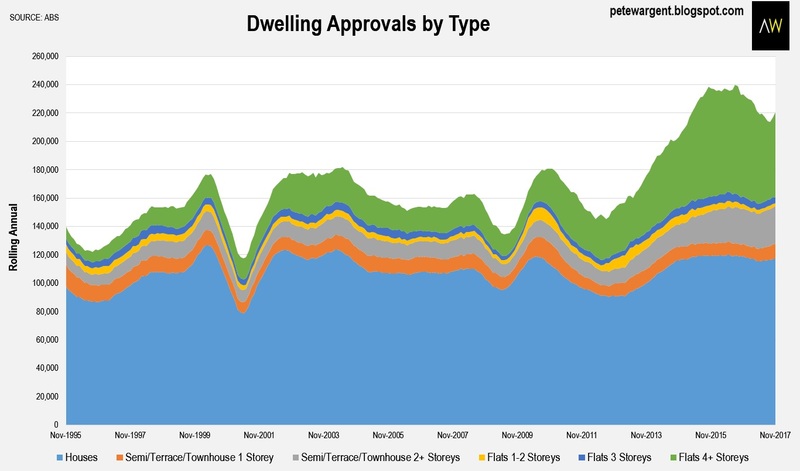 Melbourne has seen 14,858 dwellings approved in the space of just two months, including a massive 9,754 units and townhouses (whether they actually get built is another matter entirely, with APRA apparently doing its level best to strangle access to housing credit). 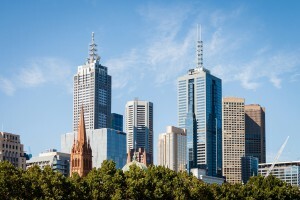 Interestingly while the rest of the country is shifting towards townhouses and more varied forms of accommodation, Melbourne has reverted to type in approving thousands of tower block apartment units. 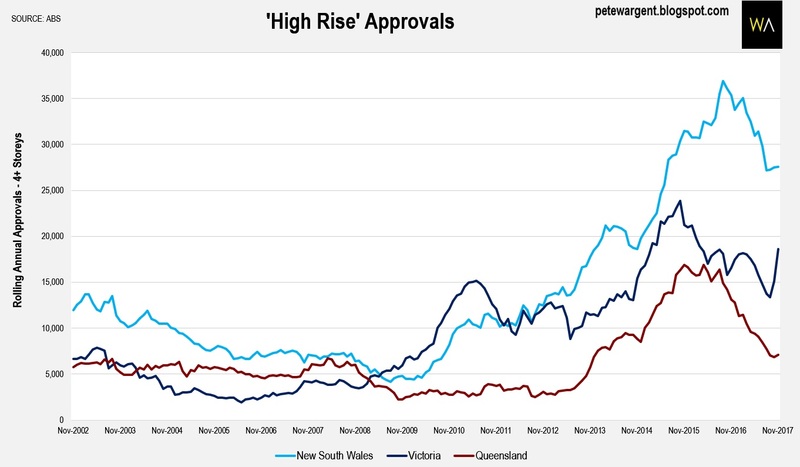 Elsewhere, the high-rise approvals boom looks to be cooked, but Melbourne now has the highest rate of immigration in Australia and is still going strong, at least for now. Down in Tasmania, despite some predictions of a property market slowdown homeowners can look forward to double-digit price gains again in 2018, with stock levels low, the market remaining extraordinarily tight, and rents booming. 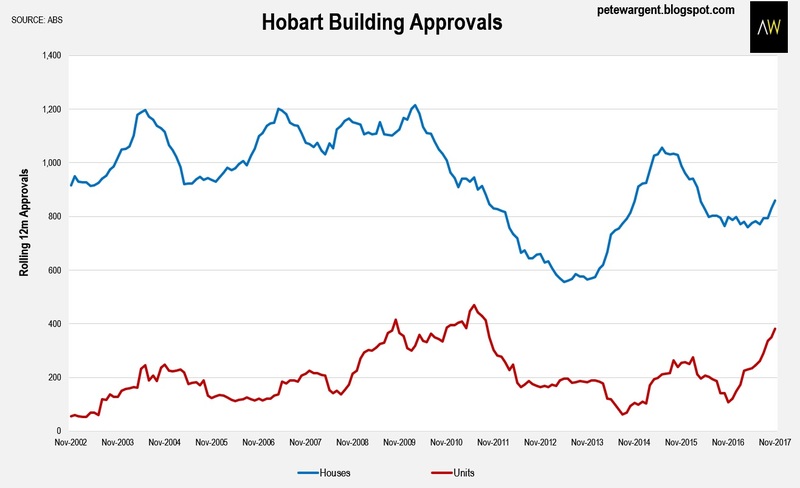 There is now just the first semblance of a supply response taking shape, but it won’t have any meaningful impact this year, not least because apartments take longer to be built than houses. 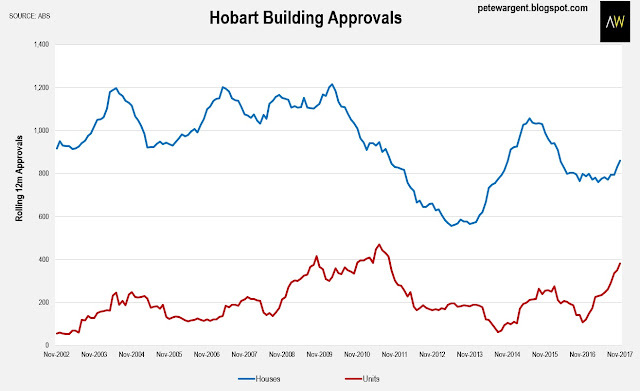 Totting it all up building approvals have been trending higher for 10 months, going against all market expectations. 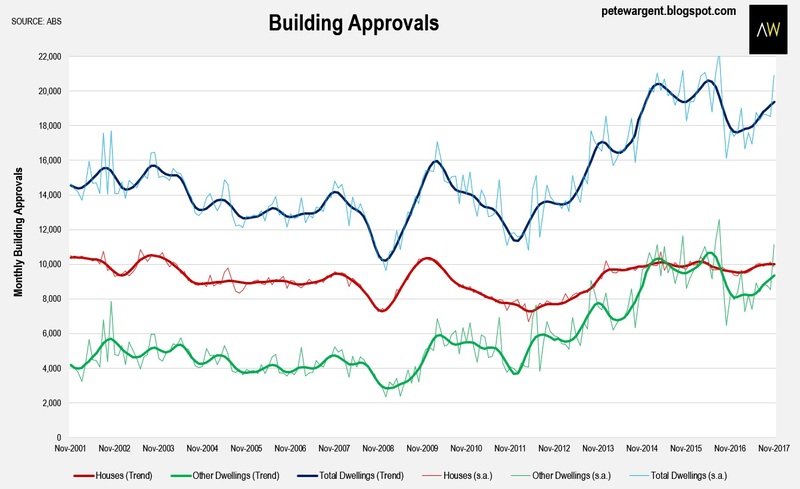 On that basis, residential construction may not prove to be much of drag in 2018 after all, with more than 222,000 dwellings approved over the year to November 2017. The suburb of Footscray has some 40 separate apartment projects in the pipeline, totalling 7,350 individual units. However, flagging pre-sales may mean that some projects are never built, despite the booming population in Melbourne. It’s interesting how when an idea becomes popularised views can be changed without being much questioned. Just a couple of years ago interest-only loans were generally seen as a sensible and flexible way to borrow, especially with the increasing use of offset accounts and mortgage buffers. 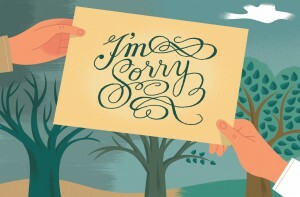 Now it’s become received wisdom that interest-only loans – essentially just another type of mortgage, albeit with slightly different repayment terms – are a dangerous evil, and must be extinguished at any costs. 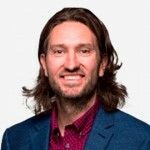 With the imposed arbitrary speed limits now being comfortably met, Westpac are offering heavily discounted interest-only loans to investors, but serviceability tests are still being carried out at sky-high levels, comparatively speaking (at several per cent or more higher than the mortgage rate in many cases). 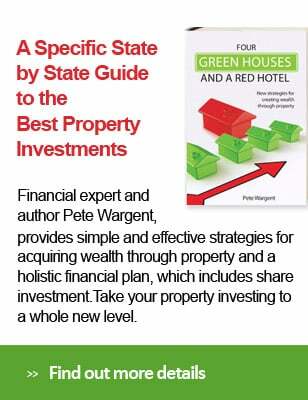 With the economy suddenly gathering momentum and the outlook brightening considerably, the irony is that if the property market suffers any turmoil from here it will have been entirely of APRA’s own making.